We all know St. Martin de Porres, but what about other great black saints? Below are stories I found about seven years ago while searching for great black Catholics. I realize that you’ll see some of them as being beatified by the conciliar popes, but I’ll leave most of the articles written just as I found them. 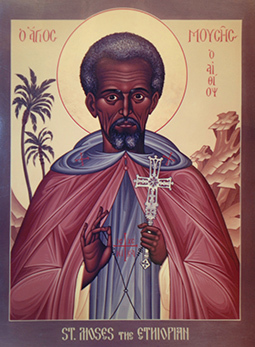 SAINT MOSES THE BLACK, also called the Ethiopian, was an escaped slave of an Egyptian official. He became the leader of a 75 member gang of bandits who terrorized all of the Nile Valley. He was a big powerful man. Once a dog prevented Moses from a robbery, and Moses intended to revenge the owner of the dog. The owner fled and Moses stole his sheep and ran from the authorities. When he came upon a monastery in the desert of Scete, he intended to rob and terrorize the monks whose holy abbot stopped Moses with his kindness. Moses was ashamed and begged the monks to stay with them at the monastery. Their lives greatly influenced Moses. When a group of robbers attacked Moses in his cell, Moses overthrew them all and dragged the robbers in front of the monks who were in prayer. Moses’ mercy convinced the robbers to repent and join the Christian monastery themselves. Brother Moses was ordained to the priesthood as a desert father himself. He founded a monastery of 75 monks, the same number as his former group of thieves. There’s a famous story told about Moses’ wisdom. Once a brother had been caught in a particular sin, and the abbot asked St. Moses to come to the church and render judgment. He came reluctantly, carrying on his back a leaking bag of sand. When he arrived, the brothers asked him why he was carrying such a thing. He simply said, “This sand is my sins which are trailing out behind me, while I go to judge the sins of another.” At that reply, the brothers forgave the offending brother and focused on their own salvation. In 405 A.D., at age 75, word came that a group of barbarians were going to attack. St. Moses forbade the brothers to fight back, but to flee. Moses and seven others stayed and greeted the invaders with open arms. St. Moses, and the other seven suffered martyr’s deaths. His feast day is August 28th. 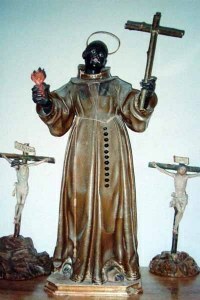 SAINT BENEDICT THE BLACK, also the Moor, was a freed African slave of Sicily. He gave away all that he had and became a hermit. When Pope Pius IV ordered hermits to join religious communities, Benedict joined the Franciscan’s in Palermo at the age of 38 as a cook. Like St. Francis, he never became a priest but was appointed superior over the others. He introduced a stricter observance of the Franciscan Rule and was venerated by all. He asked to return to the kitchen after his term was over. St. Benedict was renowned for his holiness, wisdom, knowledge of theology, and miracles. People from all over came to have their confession heard by him. He died after a severe illness, at the hour he had foretold. King Philip III of Spain paid for a special tomb for this holy friar. Years after his death, when his body was exhumed it was found incorrupt. His veneration spread throughout Italy, to Spain and Portugal, and even to Latin America. St. Benedict was beatified by Pope Benedict XIV in 1743 and canonized in 1807 by Pope Pius VII. Teresa (1676-1748) was a princess born in 1676 in the West African country now called Guinea. As a young princess, Teresa eagerly went with her family to worship at Lucero, the god of their small kingdom. But when everyone bowed to worship, Teresa felt very disappointed. The people soon recognized Teresa’s gift for deep reflection. They admired the child helping the sick and encouraging the distressed. Her older brothers began to worry that the people would want her to become ruler after her parents instead of them, but Teresa reassured them that she had a different plan. When she was 10, she was kidnapped by Spanish sailors and taken as a slave. When they found out she was royalty, they sold her to a wealthy family that made her part of their family. In the 1700`s she attempted to enter a convent but was refused due to her race. Finally, the convent of the Dominican Sisters of the Third Order of Saint Mary Magdalene accepted her. However, the bishop would only allow her to be a maid in the convent. Finally, after several years and now with the bishops blessing, she was accepted as a fully professed Dominican Sister. After 40 years of convent life, Sister Teresa died on December 6, 1784. Many miracles have occurred due to Sister Teresa’s intercession and many people hope and pray for the day when Venerable Teresa Chikaba is proclaimed a saint of the church. Isidore worked as an assistant mason for European colonists in what was then the Belgian Congo and later known as Zaire, and is now the Democratic Republic of the Congo. He converted and was baptized May 6, 1906 at age 18 after receiving instruction from Cistercian (Trappists) monks. Rosary in hand, he used any chance to share his faith; though untrained, many thought of him as a catechist. He left his native village because there were no fellow Christians. 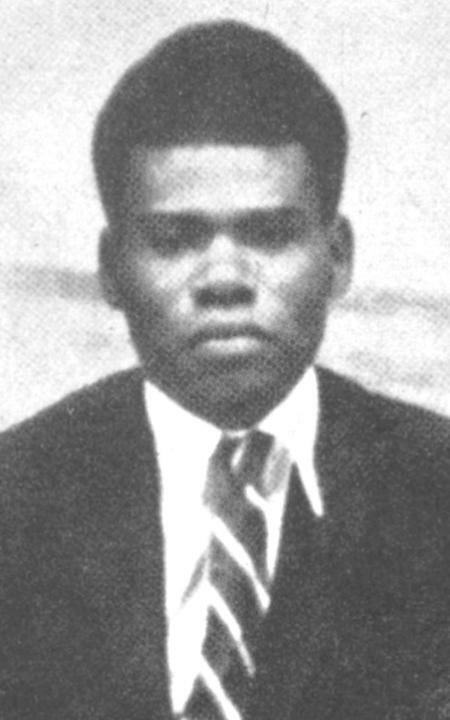 Isidore worked as a domestic on a Belgian rubber plantation. Many of the Belgian agents were atheists who hated missionaries due to their fight for native rights and justice; the agents used the term “mon pere” for anyone associated with religion. He encountered their hatred when he asked leave to go home. The agents refused, and he was ordered to stop teaching fellow workers how to pray: “You’ll have the whole village praying and no one will work!” He was told to discard his scapular, and when he didn’t, he was flogged twice. The second time the agent tore the scapular from Isidore’s neck, had him pinned to the ground, and then beaten with over 100 blows with a whip of elephant hide with nails on the end. He was then chained to a single spot 24 hours a day. Two missionaries who spent several days with him reported that he devoutly received the last sacraments. The missionaries urged Isidore to forgive the agent; he assured them that he already had. “I shall pray for him. When I am in heaven, I shall pray for him very much.” After six months of prayer and suffering, he died on August 15, 1909, rosary in hand and scapular around his neck. He was beatified April 24, 1994. 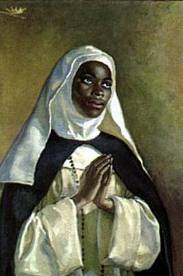 Anuarite (1941-1964) was a virgin and martyr. 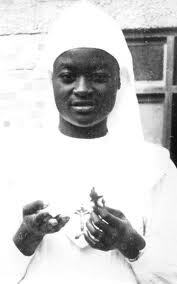 She was a member of the Holy Family Sisters in Kinshasa, Zaire. When she started primary school she was registered by error with the name Anuarite. That was the name of her sister. In her language the name meant, “I laugh to myself about war.” The error was providential. At baptism, she received the name of Alfonsina, and in religious life, the name Marie-Clémentine. She was raped and killed by the Simba rebels on December 1, 1964. Pope John Paul II went to Kinshasa, Zaire and celebrated the beatification ceremony on August 15, 1985. She was the first Bantu woman elevated to the altars, and like in the first centuries Christianity, a virgin consecrated to the Lord. She followed in the footsteps of great women like Saints Cecilia, Agnes, Lucy, and so many others. Anuarite’s life was a lesson of modesty, love, fidelity and valor. In her life one sees a wonderful example of the freedom of the children of God, freed from all manner of disagreements and impositions. She demonstrated how God chose the weak of this world to shame the strong. Peter was born in 1912 in Rakunai, a village on the Melanesian island of New Britain, which today is an eastern province of the independent nation of Papua New Guinea. Due to the lack of documentation, destroyed by the Japanese during the war, it is impossible to determine his date of birth. This is also the case for his martyrdom and for almost all the events in his life. In the culture of Papua New Guinea it was not customary to keep public records. His parents, Angelo To Puia and Maria la Tumul, baptized as adults, belonged to the region’s first generation of Catholics. It should not be forgotten that the evangelization of Papua New Guinea owed a great deal to the extraordinary faith, training and commitment of English Methodist Missionaries. On 29 September 1882 the first group of Missionaries of the Sacred Heart arrived in Matupit, New Britain, 10 years after the Methodists had begun preaching and had established the Malaguna Mission. What happened in 1898 is surprising. Angelo To Puia, the great chief of Rakunai village on the hills near Rabaul, told the Missionaries of the Sacred Heart that the majority of his people wished to be Catholic and not Methodist. It was precisely in these circumstances that Peter To Rot’s father, together with other powerful tribal chieftains, was solemnly baptized, forming the nucleus of the first generation of Catholics in the region. It was Angelo To Puia himself who opened the village of Rakunai to the faith and to collaboration with the missionaries. He promoted the Christian life in his village, where he was chief for 40 years. Beginning in adolescence, Peter To Rot had a strong inclination to piety and obedience, which convinced his parish priest Fr Emilio Jakobi that the boy was born to be a priest. But Peter’s father considered this choice premature. He felt none of his people were ready for the priesthood at the time. He nonetheless agreed that Peter should be trained as a catechist. A capable but modest catechist. In 1930, at the age of 18, the Servant of God was enrolled at St Paul’s Mission School for training catechists who would work closely with the missionaries in evangelization. He succeeded brilliantly in his studies and in 1933 obtained the catechist’s diploma. An account testifies to the character of this young student: “…He was modest and there was not the slightest vanity in him, neither with regard to his background nor capability. He let the older catechists guide him in his work and accepted their advice, but eventually eclipsed them all and soon became their recognized leader, although he was younger”. When he had completed his studies, Peter was assigned to the mission in his own village, and so began his work as a catechist in Rakunai. These were years of intense work to organize catechesis in the village, to gather large and small groups for instruction and prayer, and to become acquainted with people’s real life situations. All those who had him as their catechist recall his straightforward, immediate and effective teaching. He referred constantly to the Bible and always carried it with him (rare for Catholics of the time! ), quoting it directly as the occasion required. He was particularly sensitive in discovering the inner problems in others’ lives and shared them intimately. When he had completed his studies, Peter was assigned to the mission in his own village, and so began his work as a catechist in Rakunai. These were years of intense work to organize catechesis in the village, to gather large and small groups for instruction and prayer and to become acquainted with people’s real-life situations. All those who had him as their catechist recall his straightforward, immediate and effective teaching. He referred constantly to the Bible and always carried it with him (rare for Catholics of the time! ), quoting it directly as the occasion required. He was particularly sensitive in discovering the inner problems in others’ lives and shared them intimately. On 11 November 1936, the only certain date in his life, Peter To Rot married the young Catholic Paula la Varpit from a neighboring village. Their marriage was celebrated in church but many local traditions – like the 50 shell necklaces to buy the bride – were joyously included. Three children were born from his marriage with Paula: Andrea, who died after the war; a little girl, Rufina La Mama, who is still alive; and the third child (name unknown), who was born shortly after the Servant of God’s death in 1945 and died soon thereafter. The decisive turning point in Peter To Rot’s life and mission occurred in 1942. After the Japanese occupation, all the missionaries and mission staff were imprisoned in a concentration camp. The Servant of God remained alone. During the war he was the only spiritual guide for Catholics in the Rakunai district. With his constant presence, he provided prayer services, catechetical instruction, the administration of Baptism, the preservation and distribution of the Eucharist to the sick and the dying, and assistance to the poor. On the outskirts of Rakunai, he built a church for the Catholic community from branches, the only material available. The Japanese had destroyed the main church. The Servant of God was arrested in April or May 1945. According to accounts, his questioning by the official Meshida was a farce as well as an expression of the crudest violence. He was sentenced to two months’ imprisonment. Later, referring to his imprisonment, Peter said: “I am here because of those who broke their marriage vows and because of those who do not want the growth of God’s kingdom”. ‘A martyr for the faith.’ The Servant of God was held in a concentration camp that had been set up in a cave. Various accusations were leveled at him, including: religious gatherings, undue interference in the Japanese plan for polygamy and persistence in his catechetical activities. Then the doctor and two police officers made him lie down. Peter was stricken with convulsions and looked as though he was trying to vomit. The “doctor” covered his mouth and kept it closed. The convulsions continued for a time, while the doctor held him still. Peter fell into unconsciousness and after a long while drew his last breath. The same eyewitness gently spread the terrible news of Peter’s death to his companions. Several prisoners, taking advantage of the nighttime absence of the Japanese, wanted to see his body. Thus they verified his horrible death. But in the morning they saw a totally different scene: Peter’s corpse was now arranged on the dormitory floor. The Japanese, summoned by loudspeaker, registered great surprise when they saw Peter’s corpse. Later, to Anton Tata, an old family friend, the Japanese cynically replied that the prisoner died from a secondary infection. In the meantime, they informed the family and returned his corpse for burial, which took place in silence without a religious rite. The martyrs Daudi Okelo (1902-1918) and Jildo Irwa (1906-1918) were two young catechists from Uganda at the beginning of the 20th century. They belonged to the Acholi tribe, a subdivision of the large Lwo group whose members even today live mostly in the North of Uganda, but they are also present in Southern Sudan, Kenya, Tanzania and Congo. 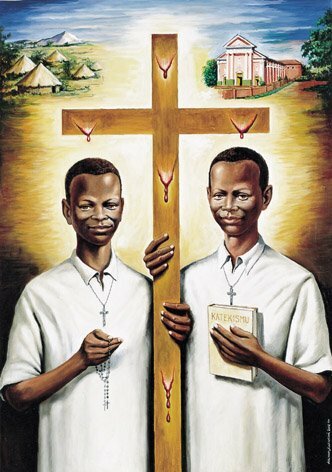 They lived and were martyred in the years immediately following the foundation of the mission of Kitgum by the Comboni Missionaries in 1915. Daudi Okelowas born around 1902 in Ogom-Payira, a village on the road Gulu-Kitgum. The son of pagan parents, Lodi and Amona, at 14-16 years of age he attended the instruction to receive baptism. Baptized by Fr. Cesare Gambaretto on 1 June 1916, Daudi received his first holy communion on the same day and was confirmed on 15 October 1916. After completing his formation, Daudi accepted to be enrolled as a catechist. At the beginning of 1917, Antonio, the catechist in charge of Paimol, died. Daudi went to Fr. Cesare, then superior at the mission of Kitgum, offering to take Antonio’s place. Daudi’s appointment came only towards the end of that year, during one of the catechists’ monthly meeting. The young Jildo Irwa was to go with him as his assistant. Before setting off, the two of them went to Fr. Cesare who informed them of the difficulties of their work, like the long travelling distance-the village was about 80 km from Kitgum-and, in particular, the frequent in-fights of the local people, instigated also by gangs of raiders and traders of slaves and gold, sporadically visiting the area. To all this Daudi is alleged to have answered: “I am not afraid to die. Jesus, too, died for us!”. So around November-December 1917, with Fr. Cesare’s blessing, Boniface, the head-catechist of Kitgum, accompanied Daudi and Jildo to Paimol. Here Daudi immediately began his work by gathering children willing to take religious instruction. At dawn he beat the drum to call his catechumens for morning prayers and, for Jildo and himself, also for the Rosary. He taught them the prayers and the catechism’s questions and answers, repeated often in a sign-song like manner during the lesson, to facilitate the memorizing. It was a matter of teaching the first elements of faith, the so-called Lok-odiku (the words of the morning), namely the essential parts of the catechism. To this activity Daudi added the visits to the nearby small villages from where the catechumens were coming, busy during the day in assisting their parents to look after the cattle or work in the fields. 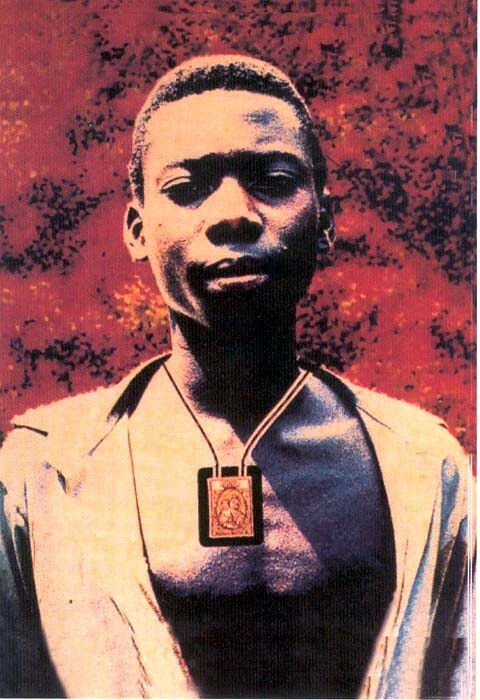 At sunset, Daudi gave the signal for common prayer and the Rosary, always closing with a song to Our Lady. On Sunday, he held a longer prayer service, often enlivened by the presence of catechumens and catechists of the area. Daudi of Payira is described as young man of peaceful and shy character, diligent in his duties as a catechist and loved by all. He never got involved in tribal or political disputes, fairly frequent at that time, as submission to the British government was often followed by ill-concealed intolerance. In fact, due to an unhappy decision taken by the District Commissioner, there rose a serious tension. Raiders, Muslim elements and witchdoctors took advantage of the violent situation to get rid of the new religion brought by Daudi. During the weekend of 18-20 October 1918, long before dawn, five people headed for the hut where Daudi and Jildo were staying with the clear intention of killing them. A village elder confronted the new comers telling them they were not allowed to kill the catechists, as they were his guests. Daudi appeared at the door of his hut and entreated the elder not to get involved. Then the intruders entered into Daudi’s hut and insisted with him that he gave up teaching catechism. Realizing that Daudi was not giving in to their threats, they dragged him outside, pushed him to the ground and pierced him with their spears. He was about 16-18 years old. His body was then left unburied until a few days later some people, tying a rope around the neck, dragged the body over a nearby empty termite hill. The mortal remains, collected in February 1926, were later placed in the mission church of Kitgum, at the foot of the altar of the Sacred Heart. Jildo Irwa was born around 1906 in the village of Bar-Kitoba, North-West of Kitgum, from pagan parents: Ato, his mother, and Okeny, his father who later became a Christian. He was baptized by Cesare Gambaretto on 6 June 1916, at the age of 10-12 years; on the same day he received his first Holy Communion and was confirmed on 15 October 1916. Father Cesare wrote about him “Jildo was much younger than Daudi. Of lively and gentle nature, like many Acholi youngsters, he was quite intelligent and occasionally acted as secretary to the vice-chief Ogal who had given hospitality in Paimol. He was of great help to Daudi in gathering the children for the instruction with his gentle way and infantile insistence. He knew also how to entertain them with innocent village games and noisy and merry meetings. He had recently received baptism, whose grace he preserved in his heart and let it transpire by his charming behavior”. He had spontaneously and very willingly offered to go with Daudi to teach God’s word in Paimol. Here he was loved by everyone because he was always available and exemplary in his duties as assistant-catechist. He repeated the same words to those who were urging him to leave that place and his duty as assistant-catechist. “We have done nothing wrong”, he was saying in tears “For the same reason you killed Daudi you must also kill me, because together we came here and together we have been teaching God’s word”. Having said this, somebody grabbed him, pushed him outside the hut and, placing him at a distance of two steps, pierced him through with a spear. Then one of them struck Jildo’s head with a knife. He was about 12-14 years old.